Remember these from our Candyology101 Treat or Trick section? It was a while ago, but I finally found them! Warheads were really popular when I was growing up in the 1990's, so I was excited to see what the brand was doing these days with their newer products. I'm hoping that these are some kind of super sour gummy worm, but they look just like normal gummy worms sold by Trolli and every other candy company out there. Maybe they made these look like normal gummy worms so that you could easily swap the two out for pranks? I guess we'll find out! After all, looks can be deceiving. Design-wise, the logo is the same as it's always been, and it takes up most of the packaging so it's easily recognizable as a branded item. 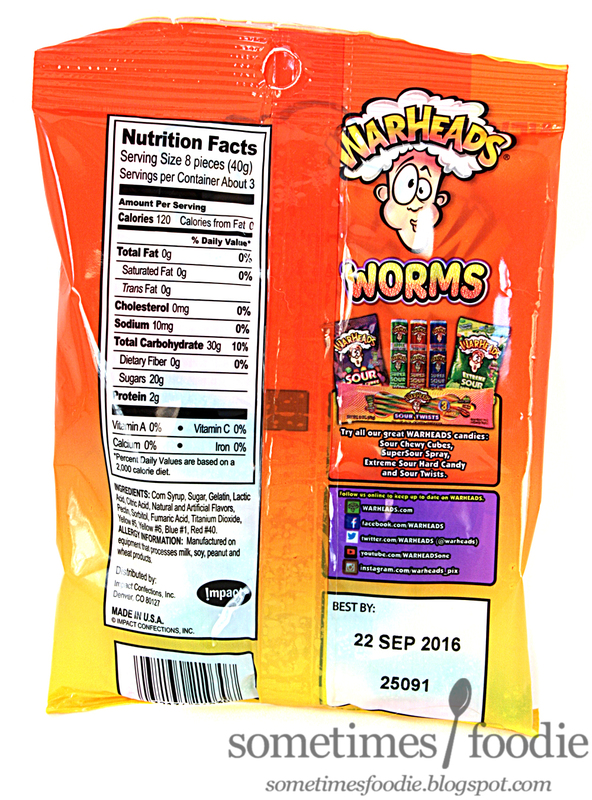 It looks really similar to the standard Warheads packaging, just with the addition of the "worms" at the bottom and the gradient background. Even though this item isn't as sleek or detailed as other products I've reviewed, I feel like this design is very cohesive with the pre-existing products from this brand, so I'd say it's successful. Even though it's a little obnoxious. I couldn't wait any longer, I opened the bag and grabbed a worm. My mouth was prepared for extreme sourness, so I popped a red and yellow one into my mouth and... WTF? It's just normal? I'm so disappointed! These aren't Warhead-like at all. These taste just like the sour gummy worms you can buy in bulk from any candy store. They're not a bad product, I like sour worms, but this is an example of a brand name being used to sell a pre-existing product. There nothing new about this candy, other than the branding. Even though they're not a new product, I'll still do a rundown of the flavors. Inside the bag there are three different color/flavor combinations, but only 5 unique flavors. All of them had the same sanding sugar outside, which is infused with citric acid, so they are sour, but not terribly so. There are slightly more sour than a SweeTart, but no where near as sour as their Warhead-namesake. Lemon & Green Apple (Yellow and Green) - The green side has a bright, but artificial, green apple flavoring that is similar to a Jolly rancher. It's sour at first, due to the coating, but the gummy itself is very sweet. The lemon side has the same sour coating, and the gummy tastes like a lemon flavored SweeTart. When eaten together, the lemon has some nice flavoring, almost lemonade-like, but the green apple is really artificial and overpowering. This was my least favorite of the three, but green apple lovers may really enjoy it. Lemon & Cherry? (Yellow and Red) - The lemon is the same as the lemon portion I've already discussed, so the only flavor left is the red side, which I think is cherry? I'm not sure to be honest. It kind of just tastes like "red." There's an artificial freezer popsicle flavoring to it, and it's pretty pleasant, but nothing too spectacular. This one tasted the best when combined, like an artificial but fruity lemonade. Overall these were an enjoyable candy, but they just aren't worthy of being a Warheads branded product. 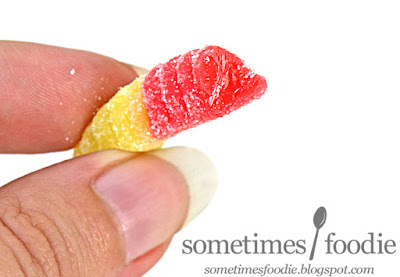 These are the same sour worms that a lot of grocery stores buy in bulk and sell under their store-branded labels. Even though this item isn't marked up and expensive, it's sold for the same .99 cents (American) as the store branded candy, you're not getting anything special or different. I really wanted these to be super sour, like the same sour coating as a Warhead, but they aren't. Unless you're really into this brand and want to support the company by buying their gummy worms instead of someone else's, I see no reason why you should buy these over the other products out there. Why they didn't do a sorta of a goo in middle of worms. Then adding more sour. 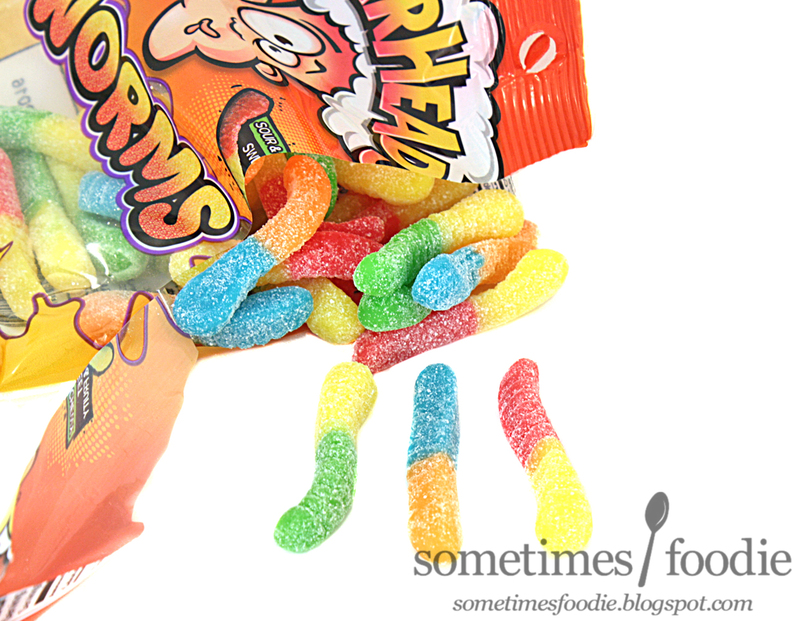 They kinda look like the Trolli Sour Brite Crawlers (http://www.weirdlyawesome.com/products). Sadly Trolli Sour Brite crawlers are way more sour then these warhead branded clones. I expected something quite sour for a gummy worm and was highly disappointed as this product is barely the slightest bit sour or tangy. I have had several of the generic worms that have tasted better and been more sour then these, I'll stick to Trolli next time instead of these sad clones. 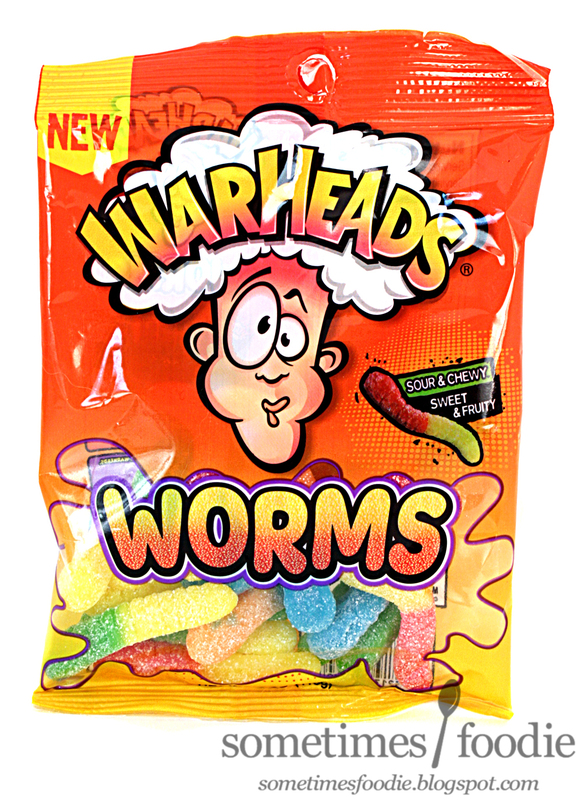 I used to love warheads growing up in the 90s and to use the name on such a pathetic product really makes me have little faith in the creativity of candy companies, we used to have way more variety,quality and thoughtfulness in our selections then are available now.